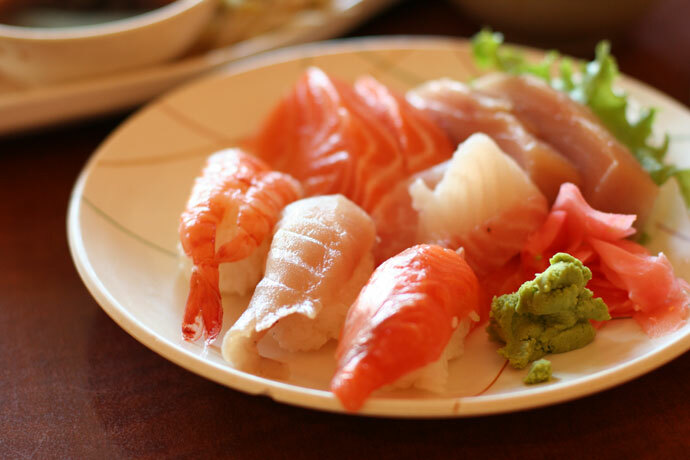 I keep returning to Samurai Sushi (web site, map, 1108 Davie Street, Vancouver, BC, Canada, phone: 604-609-0078) for good sized portions of Japanese food at reasonable prices. For more info please view Part 4, Part 3, Part 2, or Part 1. Pictured below is the 1/2 order of Futomaki ($4.25), as well as some shots of the Combo C ($12.95) which includes 5 pieces of Sashimi, 3 pieces of Nigiri sushi, some tempura, and chicken or beef teriyaki. The Combo C is a huge amount of food, and I always order it if I’m feeling especially hungry and want something fairly conventional. When I’m feeling a little more adventurous, I like trying some of their specialty rolls such as the SSSR Roll (made with smoked salmon and shrimp, $4.50) or the gigantic Special House Roll (jam packed with tuna, salmon, avocado, tamago, kani, and masago, $5.25 for 1/2 order). 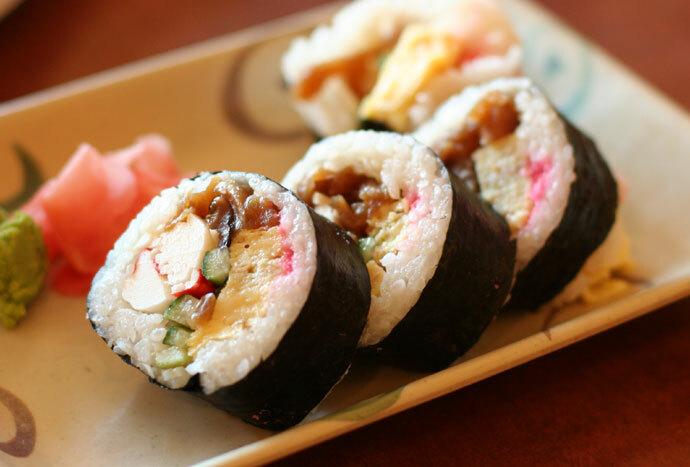 The restaurant also has some good choices for vegetarians such as the various veggie rolls, and the tofu teriyaki. Nigiri Sushi and sashimi, part of the Combo C at Samurai Japanese Restaurant. 20,222 views. 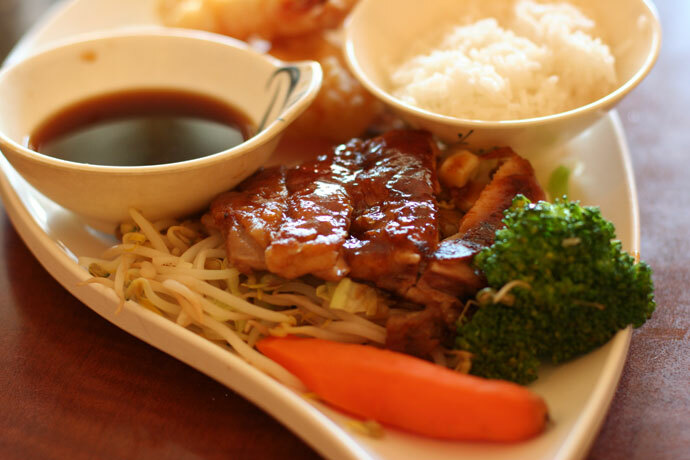 This entry was posted on Sunday, July 27th, 2008 at 1:21 am	and is filed under Affordable, Asian, Authentic, Casual, Chicken, Comfort food, Creative Dishes, Davie Street, Downtown, Favorites, Food Photos, Healthy Food, Japanese, Large Portions, Lunch, Reasonably Priced, Restaurant, Sashimi, Seafood, Shrimp, Sushi, Sushi Bar, Take Out, Vancouver, Vegetarian, West End. You can follow any responses to this entry through the RSS 2.0 feed. You can skip to the end and leave a response. Pinging is currently not allowed. Got take out from here a few times. The size of the portions really are incredible. Enough to confuse some sushi beginners I’ve brought along. Walking back to the office with take out from Samurai always makes me look like a pig too, as they like to put split their lunch combos to fill 5 separate containers. I’ve heard from other friends who have been here that the portions are just huge! Hard to tell with your great closeup shots though, as they are bit deceptive in terms of picturing how big the rolls really are. 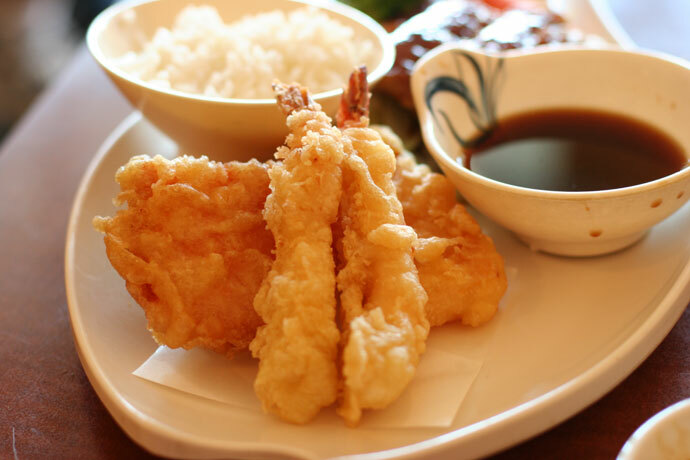 Tempura, looks pretty plain jane with the way the batter looks on them though.